The following information is extracted mostly from the “History, Directory, Gazetteer, of the Counties of Cumberland and Westmoreland …” by William Parson and William White, published in 1829. The village of Melmerby is in the Parish of the same name. In the 1820s Melmerby had about 250 people living in 50 houses. 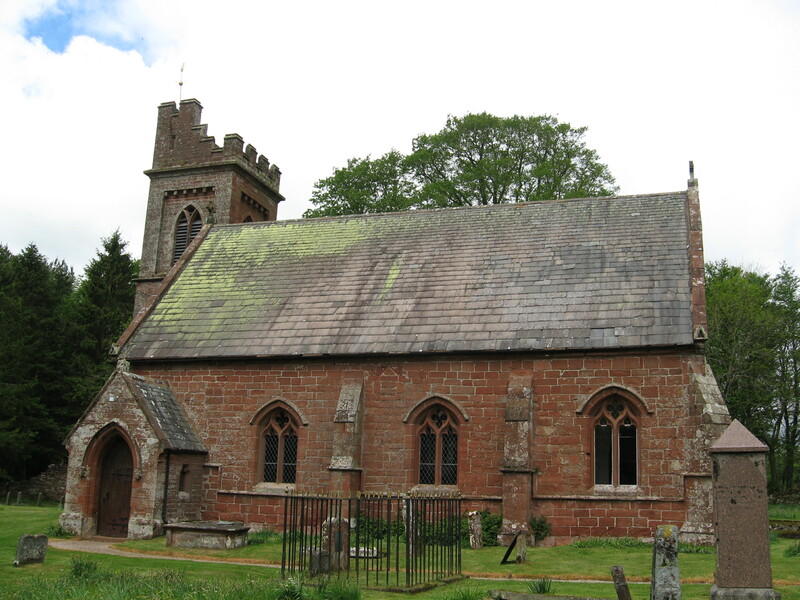 Most of the baptisms, marriages and burials of the Smiths of Melmerby took place in the Parish Church of St. John the Baptist in Melmerby. A number of gravestones for the Smiths can be found in the churchyard. They include the brown marble obelisk on the right of this photograph. Being located on the road between Penrith and Alston, Melmerby was much better served than was Gamblesby in terms of transportation. In the 1820s there were coaches several times a week and carriers available for the movement of goods and people. Among the principal inhabitants were the local Rector, Rev Thomas Bargett, as well as Robert Hodgson a magistrate and owner of Melmerby Hall, and various craftsmen and shopkeepers. The village also had a schoolmaster, John Slee, and William Varty worked as a gamekeeper to William Marshall, M.P. In the community there were 15 farmers of which 8 were yeoman. This was a different mix than was found in Gamblesby where all the farmers were yeomen. However, the smaller number of farmers in Melmerby suggests they may have had larger farms than in Gamblesby. William Smith was the older brother of Lancelot Smith of Gamblesby. The Smiths of Melmerby had family links to several of the names listed: specifically, Jameson, Robinson, and Salkeld. These links will be explored in later posts and pages. The farms in the Melmerby area produced crops of oats, barley and potatoes and many of the farms were freehold. In Cumberland as a whole there were about 7,000 freeholders at that time. However, since about the 1760s, this class of farmers was gradually being reduced in numbers because richer landowners were accumulating farms and pushing smaller landowners to sell their property and work the land as labourers. The Directory says the small yeomen and farmers generally “live meanly and labour hard”. The people are described as generally wearing clogs and eating oaten bread, formed into large thin cakes, and baked on iron plates. Barley, and black and white rye, were also commonly used for bread by the inhabitants. This entry was posted in Jameson, Melmerby, Photographs, Robinson, Salkeld, Smith and tagged Jameson, Melmerby, Robinson, Salkeld, Smith, William Smith. Bookmark the permalink.